Background: The search for new cholinesterase inhibitors is still a promising approach for management of Alzheimer’s disease. Schiff bases are considered as important class of organic compounds, which have wide range of applications including as enzyme inhibitors. 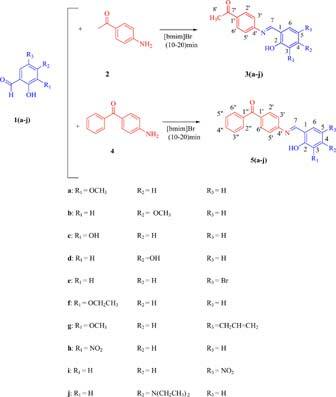 In the present study, a new green ionic liquid mediated strategy was developed for convenient synthesis of two series of Schiff bases 3(a-j) and 5(a-j) as potential cholinesterase inhibitors using aromatic aldehydes and primary amines in [bmim]Br. Methods: The synthesized compounds were evaluated for their acetylcholinesterase (AChE) and butyrylcholinesterase (BChE) inhibitory potential by modified Ellman’s method. The molecular interactions between the most active compound and the enzyme were analyzed by molecular docking. Results: Among them, 3j displayed higher inhibitory activities than reference drug, galanthamine, with IC50 values of 2.05 and 5.77 µM, for AChE and BChE, respectively. Interestingly, all the compounds except 3b displayed higher BChE inhibitions than galanthamine with IC50 values ranging from 5.77 to 18.52 µM. Molecular docking of compound 3j inside the TcAChE and hBChE completely coincided with the inhibitory activities observed. The compound forms strong hydrogen bonding at the peripheral anionic site of AChE whereas on BChE, it had hydrophobic and mild polar interactions. Conclusion: An efficient and eco-friendly synthetic methodology has been developed to synthesize Schiff bases in a very short reaction time and excellent yields in ionic solvent, whereby the compounds from series 3 showed promising cholinesterase inhibitory activity. Ionic liquid, [bmim]Br, schiff base, acetylcholinesterase, butyrylcholinesterase and molecular docking. School of Chemical Sciences, Universiti Sains Malaysia, Minden, 11800, Penang, Malaysia.